For many of us, neon lighting conjures the brash vulgarity of the retro-modern cityscape. It seems most at home in the seedy, inner-city areas where tourists, touts and punters spill out from cheap guesthouses and eateries to end up in happy-hour boozers and red-lit windows. The use of neon, however, has been used in intriguing ways from its discovery in 1898 by William Ramsey and Morris Travers in London. By the time George Claude’s Parisian company Air Liquide was producing industrial quantities of the gas in 1902, its use was quickly being appropriated by businesses as a form of permanent, luminous advertisement. Artists and designers were not far behind, eventually using these electrified tubes of rarified gas as their primary material for sculptures and installations. 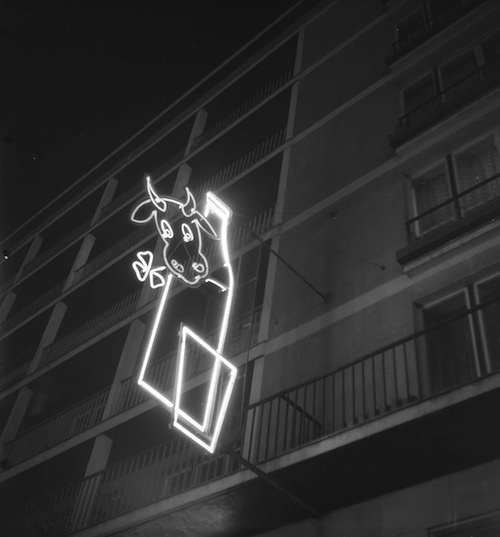 In 1957, at a conference in Czechoslovakia, Communist Party ideologues agreed that neon could be a way to reconcile the seemingly contradictory ideas of communism and consumerism in their ailing, state-run economies. The Polish Socialist Party, having created the state-run company ‘Reklama’, throughout the 1960’s and 70’s, recruited prominent artists and designers to bring about a transformation through light, playfully modifying the uniformity of the grey, drab socialist skyline. 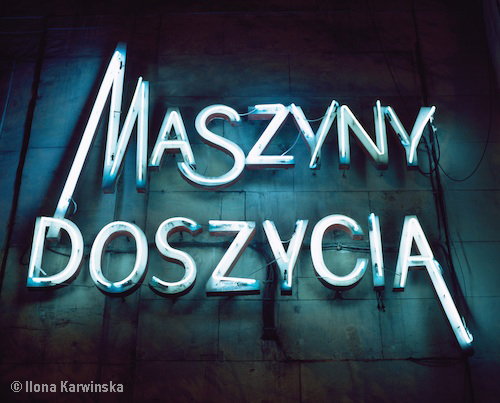 “Neon Warszawski” shows the photographs of two Polish artists, photographer and Neon Muzeum director Ilona Karwińska and independent photographer Krzysztof Wojciechowski, whose photographs of old school Polish neon signs adorn the walls of WM Gallery. Both artists present the exquisitely designed neons from the 60’s, 70’s and 80’s from different perspectives. 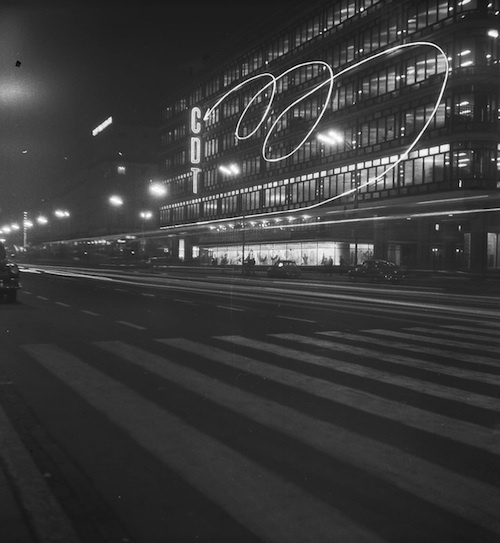 Whereas Karwińska’s photographs present the signs from a more ‘documentary’ point of view, due to her efforts of rescuing the old signage from disintegration and anonymity, Wojciechowski’s black and white photographs from the 1970’s show us night-time Warsaw as it must have been; glum, dark and deserted, enlivened only by the fanciful rectangles and curls of Poland’s premier designers in light. Ilona Karwinska MA, British fine art photographer, specializes in portraiture and world cultures. Ilona is a graduate of Goldsmiths College and the London College of Printing with a Masters degree in Image and Communication. Her most recent project 'Polish Neon' (which explores the disappearing world of communist era neon graphics) has recieved critical acclaim. 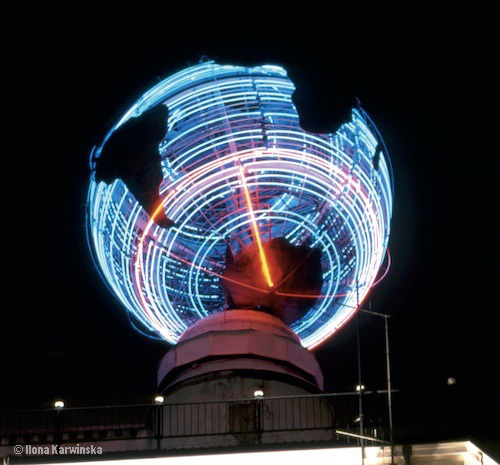 Since her 'Polish Neon' photographic exhibitions in Covent Garden London, the iconic Palace of Culture & Science, Warsaw and Luxembourg's Fundacion de Architecture, her project has been credited with starting a 'neon revolution'. KRYSTOF WOJCIECHOWSKI, Warsaw (PL), Photographer, video artist and curator. Wojciechowski started out studying physics at the University of Warsaw and began to photograph in the 1960s. In 1968, he met Andrzej Jórczak and began, what was to become a fruitful artistic cooperation for the both of them. Their first exhibition (together with Paweł Łucki) took place in 1969. In the first half of the1970s Wojciechowski became an active member of the Remont Gallery group. This gallery, led by conceptual artist Henryk Gajewski, was then one of the very few galleries in Poland that promoted and presented conceptual art. Since 1975, Wojciechowski became a member of ZPAF (Union of Polish Art Photographers). Later, in the 1970s and 1980s, he realised two large projects: "Children's Plays" and "Passer-by"; the latter being a documentation of political graffiti. His work can be regarded as consisting of two main bodies: metaphorical " and "Musica Muta") and para-journalistic works ("Parabolae", "Levantine stories", "Colours of War").